We have plots for 11 individuals, families or community groups to have their own garden at the REAL Community Garden. We have many plots available in 2019 as many of last years gardeners are not returning. If you would like one, don’t wait, contact us now! Contact Katie Hoffman at [email protected] or call (613) 983-3360. Another option in Smiths Falls is the Community Carrot Garden which operates on the grounds of Heritage House Museum. Contact Ken Manwell at [email protected] or phone (613) 284-0848 for additional information. You should choose a location that is easy for you to access on a regular basis. Each gardener is responsible for planting, maintaining and harvesting their own plot. The raised cedar beds were built in 2011, and replaced the four straw bale plots used in 2010. The cedar rail fencing you see was the result of four Heritage Cedar Rail Fence Building Workshops. The Stone Soup Sharing Plot was added in 2012, and three additional plots were added in 2014. Thanks to Rideau Community Health Services, ecoPerth/Lanark Local Flavours and REAL for making the 2014 expansion possible. Several water barrels are located on site for watering. Keeping the barrels filled from the tap and hose located on the building’s exterior is a shared responsibility. A compost demonstration site was added adjacent to the gardens in 2018 and is still being developed. The REAL Community Garden is a great opportunity for a family or community group looking to experience gardening for the first time, or even experienced gardeners who do not have access to a suitable location. Guidance is available for novice gardeners. In May 2012 we added one more plot called our “Stone Soup Sharing Plot. The idea is that visitors to the garden can sample what they find in that plot, (but that plot only!) Please don’t interfere with the other eight plots. Snack on a cherry tomato, nibble on some dill, munch on a radish… it is for the community. Why Stone Soup? In the traditional stone soup story, initially reluctant villagers each contribute a little bit of food to a soup pot that starts with just a stone and some water, creating a wonderful soup that is enjoyed by all. See wikipedia for more. 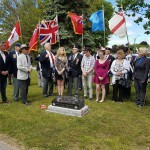 In the spring of 2010 a series of four garden plots were built on the site of the REAL Deal for use by four partners: The Smiths Falls and District Club for Youth (SFDCY), Big Brothers Big Sisters (BBBS), The Link and REAL. These partners each planted and maintained their own vegetable (or other edibles) garden. History. REAL had been interested in a community garden for our Environment Centre since moving onto the property in 2008. But for various reasons, funding being on of them, we did not get started. Three other local efforts to establish a community garden in Smiths Falls over the past ten years have faltered. One major reason was the lack of a suitable space, and another was a perceived lack of interest among residents. REAL felt we had a suitable space – enough sunny, open area, access to water, and within walking distance of downtown. Startup in 2010. REAL decided to put out a call for interested residents, and a meeting was arranged. We had some people experienced with gardening and community gardens in particular, ecoPerth looking to promote gardening in this area, and a few organizations looking for a rewarding activity for their members. 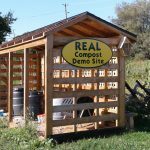 The partners involved created four raised straw bale garden plots and managed then jointly. But each had their own plot to plant and harvest. REAL was one of the partners. See some photos of the 2010 garden. Additional Interest in 2011. Our efforts stirred some interest in the community, and a result we were able to put a call out and attract additional gardeners to take a total of eight plots in 2011. A contribution from the Community Health Centre paid for the bed construction. Much of the wood you see was donated. The group also made a successful application to the Walmart-Evergreen Green Grant program who have generously funded the soil, gravel, wood supports and signage.